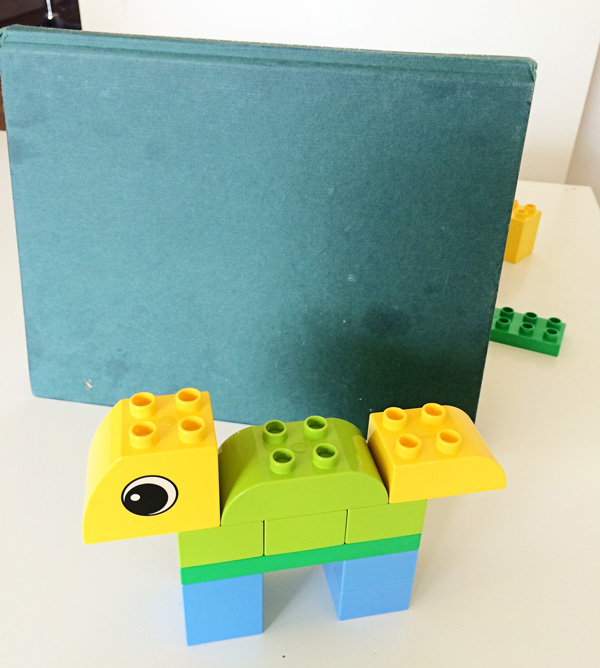 We love these great ideas for learning with Lego Duplo. 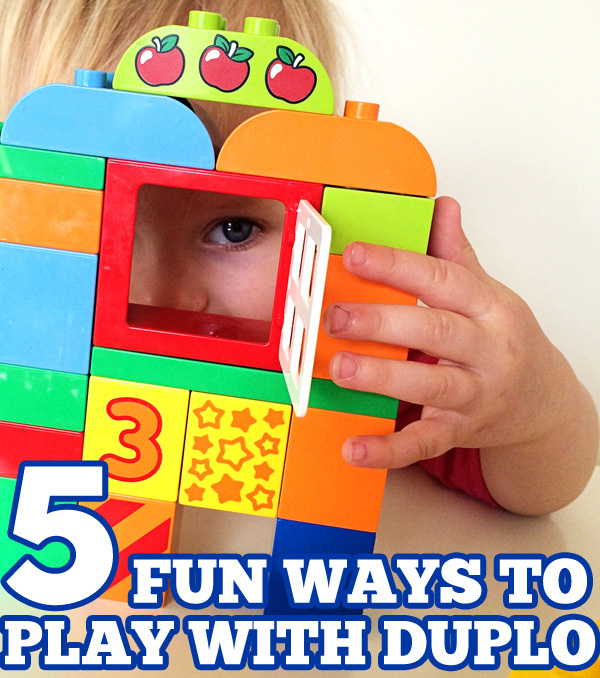 Duplo has to be one of the most widely loved construction toys for toddlers and preschoolers. Which is not surprising, given playing with Duplo provides children with plenty of opportunity to develop all of the skills listed above, whilst also being incredibly durable, versatile, and as the pieces from each set can be mixed and matched it is great for open ended, creative play, and it’s even easy to clean! While we all know how easy (and fun) Duplo can be for free play today I want to share five more ideas for extending the learning potential of Duplo play. 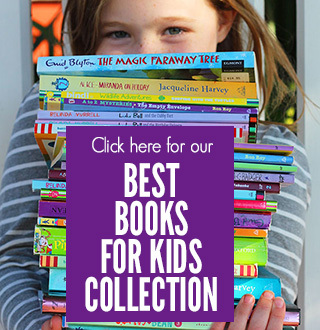 These ideas work well with preschoolers and even older children – which means it will be put to even more use in your home! This fun game is perfect for playing in pairs and it is fabulous for developing thinking, communication and co-operation skills. Begin by dividing your Duploe bricks so that each player has an identical set of 10-15 bricks. With each player sitting on opposite sides of a table, set up a large book, box or other barrier in the middle of the table – so that one player cannot see what the other is doing. Player One builds something using their small collection of bricks; make sure that Player Two isn’t peeking to see what is being made! Then Player One needs to give Player Two a series of verbal instructions, one at a time, so that Player Two can re-create the very same construction. Have fun comparing the results once the construction is done!! 2. What can you make with these 10 (or 15 or 20) bricks? 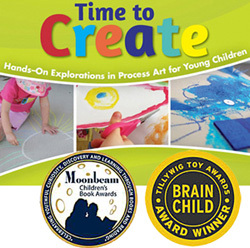 This game works well with small groups of children. Begin by dividing the Duplo bricks so that each player has an identical set of 10 bricks – it works best if each set has a selection of different sized/shaped bricks. Have the children sit with their backs to each other and give them two minutes to construct something interesting with their bricks. Once time is up, turn around and compare results. Alternatively, provide each child with a greater number of bricks and set a challenge to build something more specific – for example, what is the tallest construction you can make? Or make something symmetrical. Make something that moves. Make an animal. Make a tower with three openings. Your challenge can be as simple or as complicated as you like, depending upon the age and ability of your children. 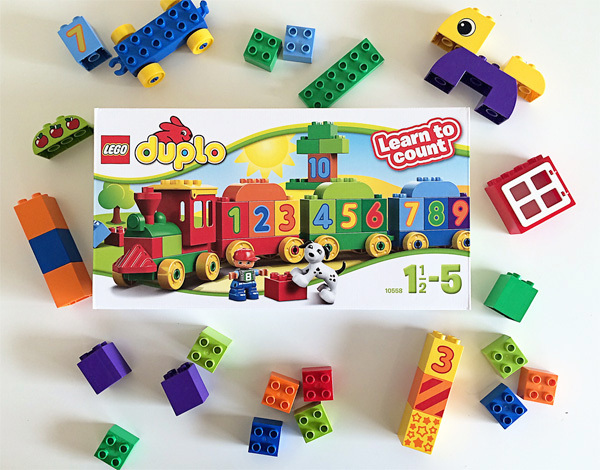 I have previously shared a game for mathematical attribute learning using Uno cards, and it is easy to apply the same principles to a game with Duplo bricks. To make a one-difference train, each brick in the train must be different by just one attribute (colour, size, shape, pattern) than the brick preceding it. How long can you make your one-difference train? We used the Duplo Number Train, but any numbered blocks will work for this. 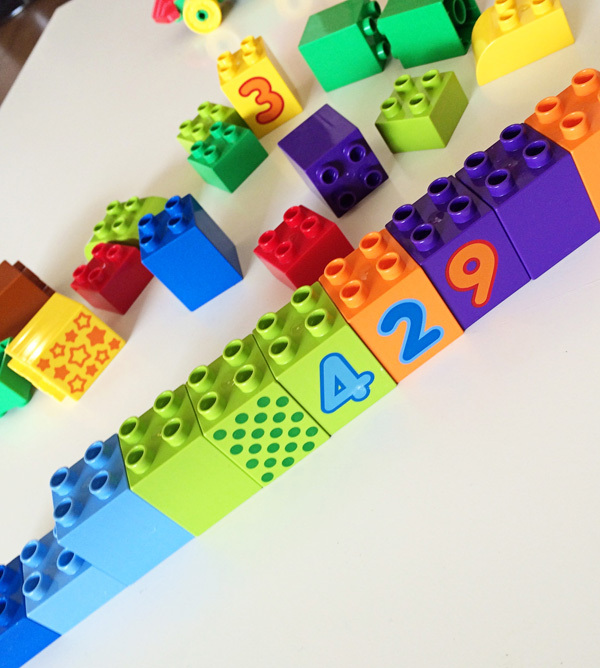 Duplo bricks can be a great resource for early measurement experiences. 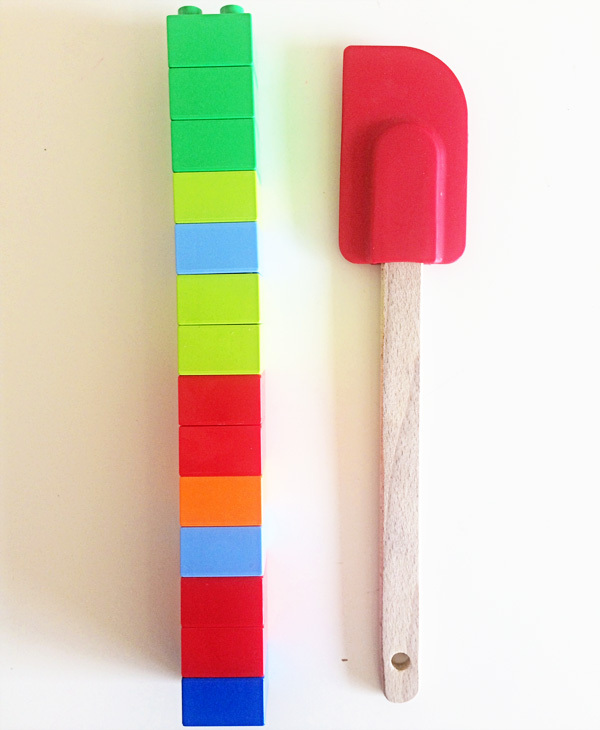 Simply set your child with the task of calculating the length of a series of common household objects using Duplo bricks as their measurement tool! It is best to use bricks that are all the same size (I recommend the smaller standard bricks). Join the bricks together to make a tower that resembles a ruler and use your tower as a measuring tool. Challenge older kids to estimate the length of the item in bricks before they actually try to measure it. They can also record their findings. Take building to a whole new level with a change of perspective! Attach your Duplo base plate(s) to the wall (or an art easel) with removable 3m hook & loop strips. 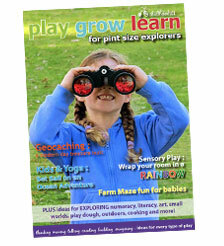 Create pictures or build towers on a vertical plane for some extra tricky planning and building. 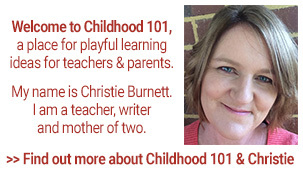 For those looking for even more Duplo play and learning, check out the previous 10 ideas I shared a few months ago here. Oh I love the barrier game idea!! My kids will LOVE that! 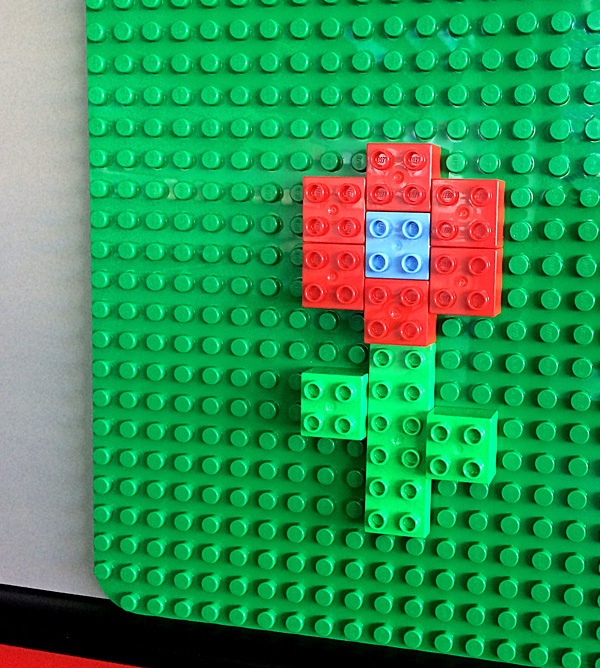 What we love most about Duplo is that is sparks our kid's imaginations!! I love how LEGO DUPLO is long-lasting and durable, easy to clean, and provides hours of open ended play for my kids. I love that you don't loose pieces quite as easily as the little lego. We have little lego everywhere. EVERYWHERE! Our grandsons played with Leggo, and became free thinkers in what they could create themselves, we would love to provide the same to our beautiful grand daughter Evie. 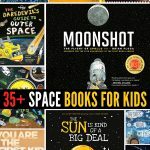 Would love some of these for my first grandbaby who is due soon so they will be able to experiment and learn like my kids did ! Hours of quiet time for mummy as the little ones interact, learn and discover. The biggest discovery, laying duplo traps for parents feet! I love that with duplo it's educational. .you learn as you play! ! I was starting to feel that my little girl was starting to move beyond the DUPLO LEGO but these ideas are absolutely brilliant and will no doubt extend our DUPLO play. Thank you!!!! LEGO DUPLO gets the whole family involved in the play. The Mister may pass on Barbie, but never on a chance to play with LEGO. My daughter absolutely loves Lego Duplo and would benefit from more to play with. 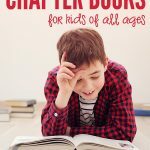 Great game ideas to add to the fun. She's an only child so needs the stimulation of toys to encourage her mind. Great ideas as usual Christie! 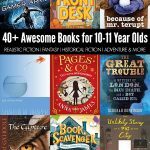 I love the idea of challenging kids to see what they can build with a set number of blocks or a set time limit - it encourages creativity in a different fun way! My kids love playing with Lego Duplo all the time, but I love especially how easily it is for people to play with it together. Grandparents, aunties and uncles, and cousins can all play together (usually) harmoniously. I like Duplo. I also like birds. I like Duplo birds the best. Duplo birds on a Duplo house eating Duplo apples. I like apples. Thanks so much for these fantastic extension ideas Christie! I love your blog! I love that DUPLO can be mixed together. It's one toy I'll be keeping for my grandkids! You won't find our DUPLO at the markets! I love DUPLO because, DUPLO = hours of open ended, creative, explorative, thinking, problem solving, enjoyable PLAY! LEGO DUPLO was my toy of choice when I WAS A CHILD! Clearly it is a durable, lasting product that stands the test of time.................and children! Lego Duplo is gold! What I love most is how Duplo engages my children through different ages, right from the toddler years up to primary school. I love LEGO DUPLO because of the magic moments it give me watching my sons play, create and learn together. I love that Duplo brings my children together. It is an amazing toy that they can do together or side by side. I love that DUPLO doesn't hurt as much as LEGO when you stand on it. I really, really mean it. Stackable, unbreakable, bright and light, Colourful, wonderful, sure to delight. A great size for little hands, But the older kids are still big fans! Stepping on it ; ) Great for all ages, from 6 mth as teether, to the inner child of adults. Duplo opens the doorway to a world of imagination. The endless list of possibilities to create always engages my little ones.